One of the most successful designs of chair internationally in the past few years – the aye by Jacob Strobel. The chair combines modernity, organic shapes and traditional craftsmanship in one distinctive design that is striking and yet timelessly elegant. The seat is hand-like in its enveloping of the body, ensuring a sense of security and comfort. The vertical ridge that runs down the back brings a human spine to mind and creates a link between the design and nature. Equally as eye-catching are the sidecuts of the backrest, which give the chair its sculpture-like character and can also be used as handles. aye used to be available with leather upholstery only, but is now also available with high-quality wool-based fabric covers or in an exciting combination of fabric and leather. The natural textures and soft surface of the woollen material take the chair to a new level, becoming a feature of the design itself. The sophisticated two-colour design and the leather/fabric mix for the inside and outside of the seat shell are both particularly elegant. 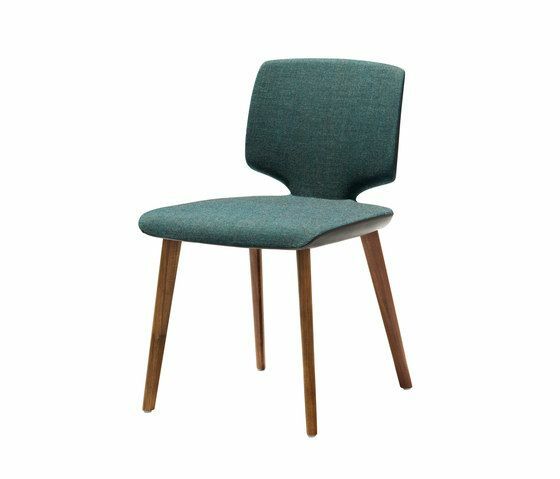 The aye chair‘s contrast between sharp, defined edges, generous curve radii and an organic look is highlighted to full effect by an attractive mix of colours, wood, fabric and leather. The piece enjoys many different looks, from casual and natural or classically elegant, all the way through to understated and dignified. Numerous colour combinations are possible for the fabric covers, be it earthy shades or sharp, bright colours. The woollen materials TEAM 7 uses in this design are supplied exclusively by textile design company Kvadrat. The natural material regulates both temperature and moisture, is very hard-wearing, and has a surface that is naturally stain-resistant. Awarded the 2012 interior innovation award, the new aye chair is a perfect blend of beautiful forms and comfort. Fine leather seams to encompass this slender upholstered chair, while precisely defined edges ensure interplay with the generous curve radii. The striking sidecut of the backrest gives aye an airy appearance, while also functioning as an area from which to hold and move the chair. The flexible backrest, ergonomic armrests and soft, comfortable seat mean sitting at the table will definitely not be a chore. The aye chair is available in 23 shades of leather and four types of wood, with or without armrests.